My computer wouldn't cooperate when I tried to blog last night. It may have been an internet problem as I couldn't even get my email to come up. 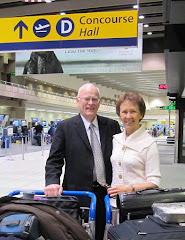 We're excited about our trip to Ottawa as we will meet our new mission president and his wife, President and Sister Patrick. The most notable news to pass on in this short message is that we have been officially reassigned to the Canada Montreal Mission and will serve the remainder of our mission here in Val d'Or. We're loving the work here and are happy to serve wherever the Lord decides to use us. This is His work. Why he put us here in such a round-about way I don't know. But I do know that this is where we belong.